What better way to spoil dinner than with this sweet treat. Raise a toast to this pretzel coated with toasted almond toffee crunch, raise it high. (Then dunk it down in a Caramel Dip). Mamma mia, this is a savory treat. Pair our Garlic Pretzels with Marinara Dip for a taste of the Old Country. Nine slices of pepperoni and a savory three-cheese blend transform the Original Pretzel into a tasty Pepperoni Pretzel. Because sour cream and anchovy pretzels would have been…well… silly. Sour Cream & Onion? Genius. Go on, feel the heat. The JalapeÃ±o peppers make this a hot, spicy treat. JalapeÃ±-yes! 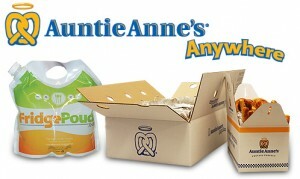 It’s a sweet treat when raisins are baked into Auntie Anne’s Pretzels. Add an order of Sweet Glaze, and you’ve found the perfect indulgence – for breakfast or any time. These on-the-go pretzel snacks are pushovers. Push ’em over your lips and past your gums. The Original Stix's younger, sweeter sibling. Nugget of Wisdom: All is delicious in Cinnamon and Sugar. Need to liven up your next staff meeting, put an end to boring meetings forever by placing your next catering order at Auntie Anne's! We'll add a new twist on your next staff, lodge, or club meeting, birthday or holiday party with a variety of fresh pretzels, dips and our refreshing lemonade! Contact one of our locations near you for more information or to place your catering order.